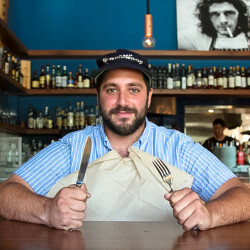 NYC-raised Jesse Furman is the chicken-fried owner and operator of Free Range LA, Los Angeles’s hippest street-smart food service caters launches the likes of Nike, Puma, Stussy, and more. An entrepreneur and professional cook, Jesse's obsession with all things food and "aggressive chicken frying" has consumed him since his early days in NYC eating and working for some of the city's most successful restaurant and catering companies. Besides operating Free Range LA daily, he blogs for The Hundreds where he highlights the insatiably delicious and contrarily gross ins n’ outs of the food and beverage world.